The modern vehicle is a rolling network of computers with dozens of connected sensors and actuators. Having embraced the introduction of electronics on vehicles some 20 years ago, we are experts in electrical fault finding and the repair of modern vehicles. Our diagnostic technicians are trained and use the latest in auto-electric diagnostic hardware and software. From battery health checks to diagnosis of complex network faults, we’re happy to help. I have what I think may be a warning light on my dash. I'm not sure what it is. Can you help? If you have a light on your dash that didn’t used to be there, the chances are it is a system warning of some sort. Please don’t hesitate to get in touch and we will let you know what the light on your dash represents and will advise upon further action if required. Is a diagnostic check included in any of your services plans? Diagnostic information stored on your car’s control unit/s provides data on current faults that may be serious and require immediate attention or flag up a fault that, if unaddressed, could cause further problems. 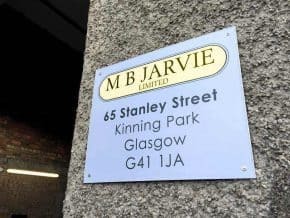 At M B Jarvie we see servicing as the ideal time to carry out a diagnostic scan/s. Having your vehicle scanned as part of a service is the most cost effective option, can give piece-of-mind or alerts you to a fault/s that may require attention. IMPORTANT NOTE – this does NOT mean that if you have an active malfunction indicator lamp illuminated on your dash it can be ignored until a service is due. If you have an active malfunction indicator lamp this should be investigated immediately. See our Service Options for details on diagnostic scans included as part of our service plans or send a message if you have a related query. Do you offer engine remapping services? Yes. You can find our more here. Established in 1981, we are an independent car service and repair garage based in Kinning Park on the south side of Glasgow. We specialise in the service and repair of German cars including Mercedes-Benz, Volkswagen and Audi. We are also an MOT testing station and provide a full range of car repair services for both modern and classic cars.